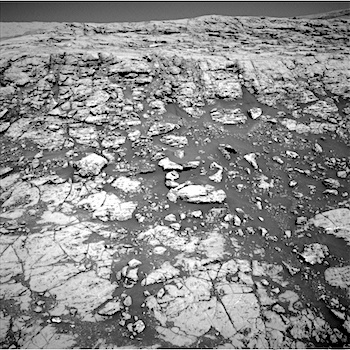 Sol 1829, September 27, 2017, update by MSL scientist Abigail Fraeman: As was predicted in yesterday’s blog, we have officially left the “Bar Harbor” quadrangle and are now into the “Kuruman” quadrangle. This quadrangle is named after a charming town situated on the edge of the Kalahari desert in South Africa. Notably, the town of Kuruman is the namesake for the Kuruman Iron Formation, an ~2.46 billion year sedimentary rock that is rich in hematite. Hematite is the same mineral we can see is distributed throughout the Vera Rubin Ridge from orbital data! The target names we will use while in this quadrangle are pulled from famous geological features from South Africa and nearby Botswana and Zimbabwe. This entry was posted in Reports and tagged Aeolis Mons, Bar Harbor, Curiosity, Enon, Gale Crater, hematite, Kuruman, Mars Science Laboratory, Mount Sharp, MSL, Mt. Hamden, Murray Formation, NASA, Noisy, Vera Rubin Ridge. Bookmark the permalink.